It was 1960’s and as a 12-year-old caddy Ray Dalio got the first taste of stock market success when he managed to triple his $300 investment in shares of Northeast Airlines. Immediately Ray Dalio was hooked. He read the annual reports of major companies, and engaged older investors in conversation. He was willing to learn by trial and error. He found that even careful research can result in mistakes, and that mistakes can be expensive. He also learned that the only way to beat the market is to be right when others are wrong. When he formed an opinion of the prospects of a given stock, he asked the smartest investors he knew to critique his reasoning. By the time he graduated from high school, he had assembled a stock portfolio worth several thousand dollars, a significant amount for a teenager in the late ’60s. Although he continued to buy and sell stocks in college, Dalio also became interested in commodity futures. As a result Dalio was ahead of the curve in learning about commodity prices, but the events of 1971 ( international financial crisis and President Nixon’s fateful decision to sever the relationship between the dollar and the value of gold) also taught him the importance of currency exchange rates, and he set out to master that subject as well. It was 1973, Ray Dalio was a rare creature having an MBA from Harvard and expertise in commodities trading. After working at Dominick & Dominick, and Shearson Hayden Stone as a trader, he personally found it difficult to adjust under hierarchical structure of these organisations. He decided to relaunch his first venture Bridgewater Associates ( once set up as a small company with his Harvard friends ). As Bridgewater’s client list grew, so did the scope of its investments. Dalio employs an investment approach called “global macro,” investing on a large scale around the world on the basis of broad systemic factors. He built Bridgewater by anticipating changes in currency exchange rates, commodity prices, inflation and GDP growth in the world’s economies. Dalio’s Bridgewater was one of the first firms to clearly identify and base a strategy on the distinction between the two classes of returns. Pure Alpha has become Bridgewater’s flagship fund, earning an average annual yield of 18 percent. Bridgewater opened new funds, including All Weather and Pure Alpha Major Markets, founded in 2011. The All-Weather fund charges lower fees, and seeks to match market return, whereas Pure Alpha Major Markets charges a two-percent fee and 20 percent of any return over market, the usual fee structure for a hedge fund. Its strategy is similar to that of the original Pure Alpha, but with an increased focus on the European bond market. Over the years, Dalio applied the insights he had gained from his study of meditation to understanding the psychological factors that influence market decisions and company management. Criticism of fellow colleagues and analysis of their mistakes are encouraged and valued, as long as they contribute to the learning process. Secrecy, gossip and behind-the-back criticism are prohibited. All meetings are videotaped and the recordings are made available to the entire organization. While Bridgewater’s workforce grew to well over a thousand employees, it remains an independent, employee-run organization. In 2010, Ray Dalio sold roughly 20 percent of the company to Bridgewater employees. He has declined all suggestions to take the company public, which he believes would dilute its essential identity. “An organization is the opposite of a building — the foundation is at the top,” Dalio says. The head of a company should determine their goals and find managers who can help them achieve them by assigning tasks to their direct reports. These individual managers should also hire employees who share their own goals, which fall in line with the company’s vision. 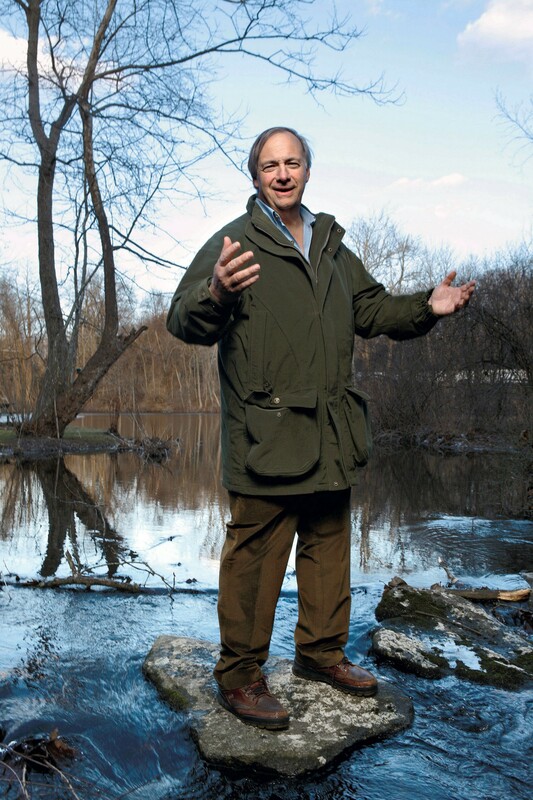 Ray Dalio is a board member of the National Fish and Wildlife Foundation. He’s an avid fisherman and bow hunter who “has gone after everything from Cape buffaloes to wild boars. Creativity doesn’t come from “working the brain”. There is no muscling involved in the process. It comes from the state of complete relaxation. Your hobby can be a potent form of meditation by helping you in opting out of the continuous loop of conscious thinking. It opens the mind. It creates an openness, a freedom, in which creativity just kind of comes through and it creates an equanimity. It helps you immensely in putting things in right perspective. It doesn’t lessen your emotions. But you are no longer controlled by that emotion anymore. What Makes Billionaire Ray Dalio So Special?